As anyone who’s ever cringed while serving a dozen ramekins of flat soufflés can tell you, preparing for a dinner party can be a lot of work. 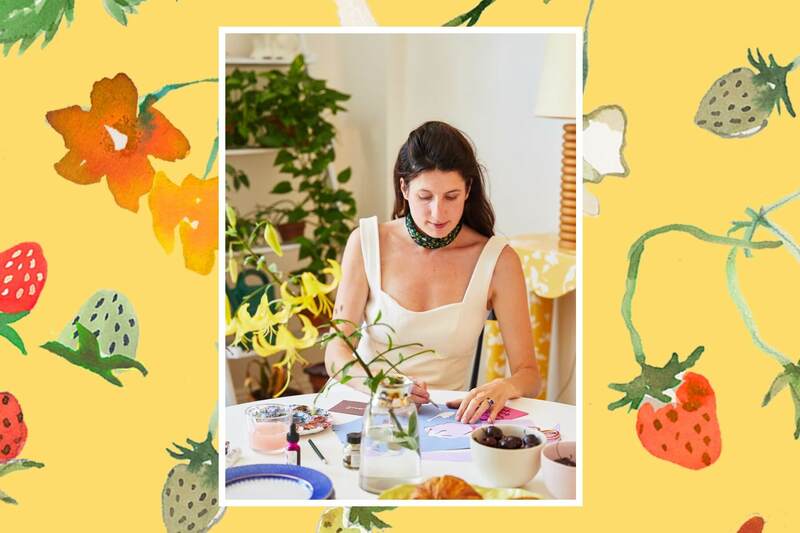 Or, it can be a wonderful last minute adventure, which is exactly why we ventured to the dreamy Brooklyn home of always-in-demand painter and Paperless Post design partner, Happy Menocal. Best known for her signature watercolors and modern heraldry, the seasoned hostess bucks the stressful dinner party stigma, offering her refreshing opinion that “it’s really about making people feel special.” Most welcome of all, her advice on how to host a perfectly imperfect affair that left us downright, well, happy. Not only is her mix and match approach far less labor intensive, it opens the door to experiment with every element, from the flatware to the menu. “Consider having people over for dessert,” Happy suggests. Celebrate cherry season with cherry pie. Don’t feel like you have to DIY; with great options from local bakeries, there’s no sense spending the afternoon re-lacing pie crust. 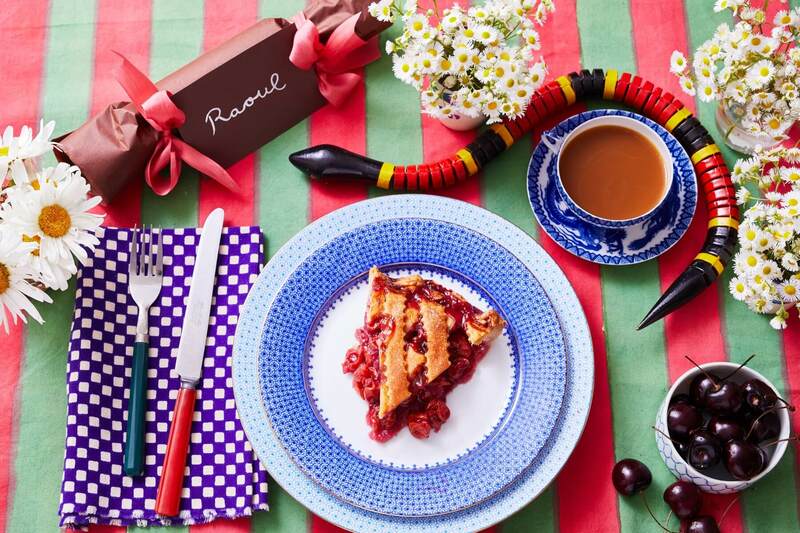 It’s never too last minute to throw a last minute dinner party thanks to our array of vibes for even the quirkiest host. Browse them all at Paperless Post Flyer. Whether you’re hosting a bridal shower, baby shower, or a shower celebrating showers, Happy’s rules of unruliness still thankfully apply. Serve a salad. It’s room temperature, easy to assemble, and colorful. We choose micro greens, but whatever is available at your nearest grocery will be fine. Decor-wise, keep flowers sweet and low. Here she used Queen Anne’s lace, Veronica, and wheat. 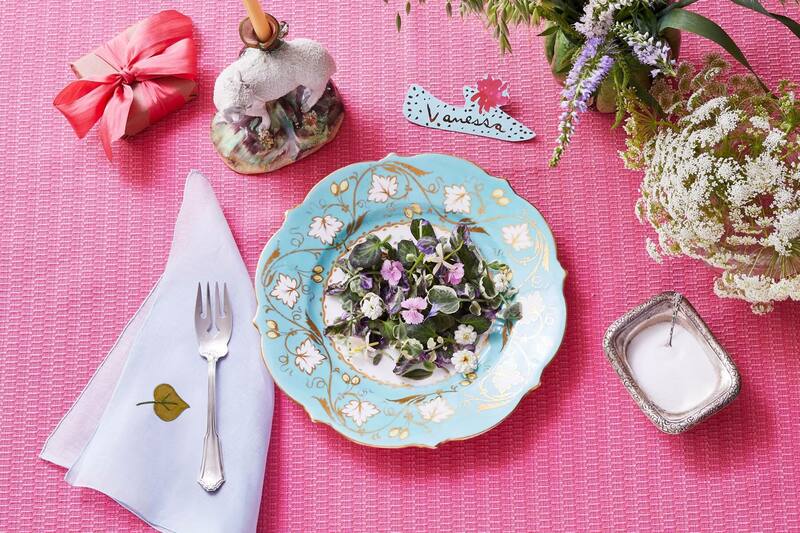 Add visual interest with solids, florals, and metallic tableware. Happy recommends starting a collection of vintage linens and candleholders to have on hand for just such occasions. They are easy to spot at thrift stores or estate sales, and they make a table feel personal. Keep an eye out as you travel and don’t think that you have to pick up a whole set at once. If you’ve spent half your day running around the heat, chances are your guests have too. 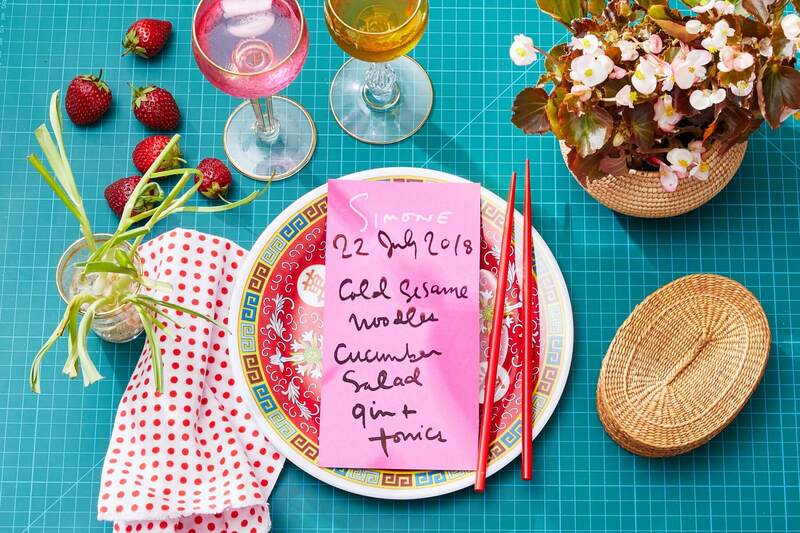 Give everybody a break by hosting an ultra-casual dinner party of cold noodles and seasonal berries. “Order in!” Happy gleefully advises. “Use real plates and napkins, but skip the cooking when it’s hot outside.” Serve alongside an easy-to-make (and even easier to order) cucumber salad, and you’ll not only make a crowd-pleasing meal, but “you won’t have to keep dishes warm as you hang out with friends.” Finally, a dinner party in which the host gets to join the party. 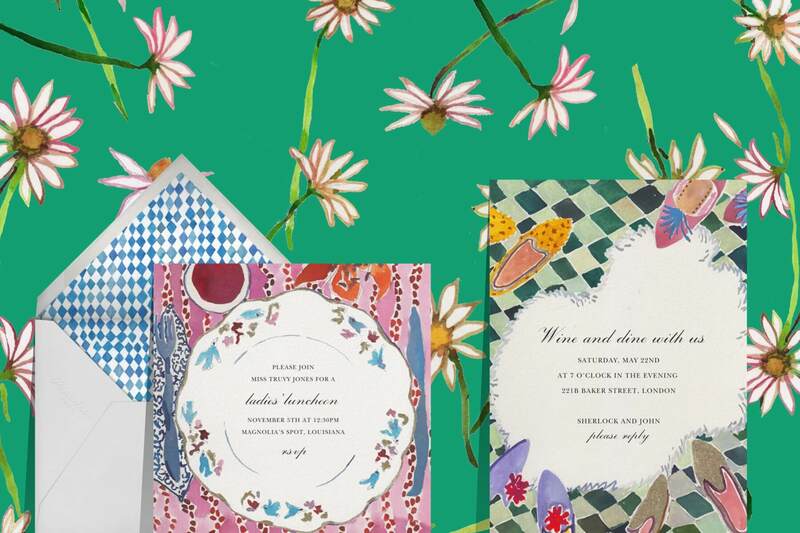 While Happy may not be available to help with your last minute dinner party, her invitations are ready whenever you are.